: : Thanksgiving weekend has officially started. For .Iz. and I it means 4 days off together, nothing big planned, no big family gatherings, just time together at home. We'll attempt to re-upholster our couch [I'll share before and after pics], relax, hike, watch movies....but what we're most excited about is doing a lot of cooking. Thanksgiving is the holiday for enjoying food, but that doesn't mean turkey to us. We've got a lot of recipes on our list, I'd like to make Lena Corwin's delicious pumpkin cranberry bread again, and maybe some new recipes from the Jamie Oliver cookbook I got for my birthday. And the pumpkin gnocchi by .delicious days. sounds original and still appropriate for the season. We will also be testing some new drinks with our meals; caipirinha's are a family favorite, and the christmas caipirinha version in one of Bon Appetite's. latest issues sounds like an delicious variation. Happy eating!! Happy Thanksgiving. Your blog is so lovely. Ha några riktigt mysiga dagar! Jag önskar mig också ett Thanksgiving-firande i USA nån gång..
Dina senaste inlägg har varit jättefina. Sounds just lovely. Have fun. Happy weekend. Happy Thanksgiving! 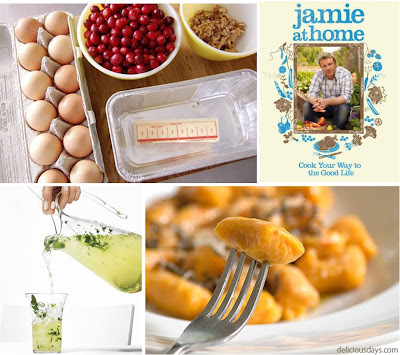 I really, really, really want that Jamie Oliver cookbook. I'm always flipping through it at my bookstore. Wow those foods and with that words of Happy Thanksgiving. Perfect combination.